Apple has launched new iMac range with Intel’s fourth generation Core processor. Apple is already is fame because of its recently launched iPhone 5s and iPhone 5c, for which company has sold 9 million units. The base version of Apple iMac comes with 21.5 inch Display, powered by Core i5 4570R processor with base clock at 2.7GHz and up to 3.2GHz with Iris pro graphics. It is priced at Rs 99,990. The high end 21.5inch model features Intel Core i5 CPU up to 3.4GHz and NVIDIA Geforce 700 series graphics with 2x video memory, which offers 40 percent faster performance that the predecessors. This high end model comes at a price of Rs 114,990. 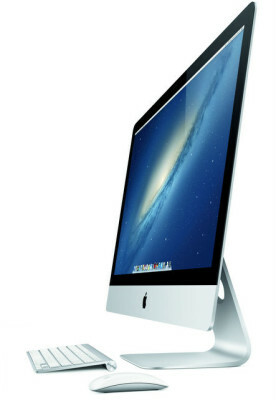 The top of the line, 27inch SKU iMac has Core i5 processor up to 3.4Ghz and NVIDIA Geforce 700 series. The price of iMac 27 inch is Rs 139,000. Customers can also upgrade to quad core Intel i7 CPU up to 3.5GHz with NVIDIA GeForce GTX 780M series GPU and up to 4GB video memory. All the iMacs comes with 8GB memory, along with 1TB hard drive, 4x USB ports, 2X thunder bolt ports and a FaceTime HD camera. The new Apple iMAC supports next generation Wi-Fi 802.11ac. The new iMac delivers the three time faster wireless performance than the previous generation. All the models are available for purchase from today.